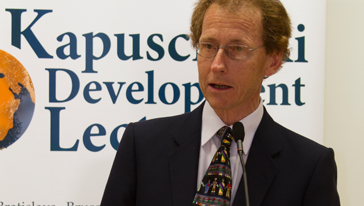 Jan Vandemoortele is the co-architect of the Millennium Development Goals. He was the Director of the Poverty Group at UNDP in 2001-2005. He has published widely on the MDGs. Vandemoortele served in various other capacities with the United Nations for over 30 years, both at headquarters and in the field – with UNICEF, UNDP, the ILO and on loan to the World Bank. His last position was as UN Resident and Humanitarian Coordinator to Pakistan. He holds a Ph.D. in Development Economics and is a regular speaker at international conferences and universities. He is member of various advisory groups, including to the UN Secretary-General and the Dutch State Secretary for development cooperation. After decades of slow growth, Africa has a real chance in economic growth. The question is whether or not this growth contributes to reduce poverty in African countries. The conventional view regards slow growth as the main reason why so many countries will miss the Millennium Development Goals by 2015. However reducing human poverty requires much more that growth, grants or governance. Foremost, human development involves fundamental transformation in society, which transcend any macroeconomic or institutional model. The global discourse about human development is dominated by the formula that ‘faster economic growth + more foreign aid + better governance = MDGs’. Slow growth stops implementation of the Millennium Development Goals, according to the conventional view. Others argue that it is insufficient foreign aid or inadequate governance that prevent so many countries from achieving the MDGs. In other words, human development is considered as either growth-, aid- or governance-mediated. Thus, the development narrative is reduced to a technical argument about these three aspects of development. To substantiate the argument, extensive use – if not misuse – is made of statistics. The latest poverty estimates of the World Bank, for example, claim that the absolute number of poor people in Africa declined between 2005 and 2008; this for the first time. Nine million fewer Africans living in poverty, is that not a reason to celebrate? Does it not prove that growth is reducing poverty?